Cornerstone plumbing has 35 field supervisors running 50-100 jobs at any given time. With that many jobs, tools are constantly moving from person to person and site to site. Cornerstone is a company “built on trust”. There is a high degree of trust in the supervisors to be professionals, give great service and take care of the company as well as customers. As Cornerstone grows, tool tracking is becoming more difficult. In the past, a request for a tool would involve the warehouse manager searching through the inventory and then calling guys in the field to try and find who has the given tool/-s. This was wasting time and was not only impacting efficiency in the warehouse, but also in the field. Beyond the wasted time, trust between the supervisors and the company was becoming lessened. When a tool went missing, it was impossible to tell who had it last. The warehouse had to ask field supervisors to find out if a missing tool had been broken, stolen, lost or simply given to another crew. The chasing of tools was creating un-needed friction. Yet, simply ignoring missing tools was far too costly to the business. Simply buying another tool was becoming the solution but an expense that impacted the company’s profitability. This situation drove Cornerstone to select and implement ShareMyToolbox to help establish a tool tracking process for the company. Cornerstone likes ShareMyToolbox is based on accountability and responsibility and that the system is designed to encourage trust between supervisors and the company. 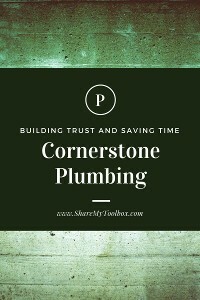 Cornerstone plumbing uses ShareMyToolbox to “enable trust & save time.” Time is saved by organizing the tool inventory and giving visibility to everyone in the company. Now, every foreman can pull out a phone and see if a tool is available in the warehouse or at a nearby jobsite. The company will hopefully save money by keeping track of who had each tool last. This helps the company make smarter decisions on buying new tools and knowing which tools are the most requested. What was the hardest part of rolling a system out? When we had the launch meeting to train guys only ½ showed up. That half liked the system and got up and running quickly. However, it has taken a bunch of time to track down the other ½ and train them individually. Do you use barcodes? What challenges/benefits have you seen? Yes, items are barcoded. Having barcodes has made the check in process easier when tools are dropped off in the warehouse after a job. However, barcodes have made the requisition process a little harder as guys will request a specific tool and sometimes it is harder to fulfill the specific barcoded item rather than just giving another tool that is essentially the same. What tip would you have for others implementing ShareMyToolbox? It has helped us to designate a space in the warehouse as a drop spot for checking tools back in. This allows the warehouse staff to scan and evaluate each tool before it is put back into inventory. It has helped us stay organized and avoid things coming back in without being scanned. If you’d like to learn more about ShareMyToolbox, visit Tool Inventory or Tool Tracking.